Following on from my Owl Button Up shirt, I rediscovered this metre of strawberry fabric I had purchased in the Abakhan sale last year, and thought it would be ideal for another Button Up*. Rather than using poppers this time, I thought I’d do it the ‘proper’ way and use some fancy buttons instead. 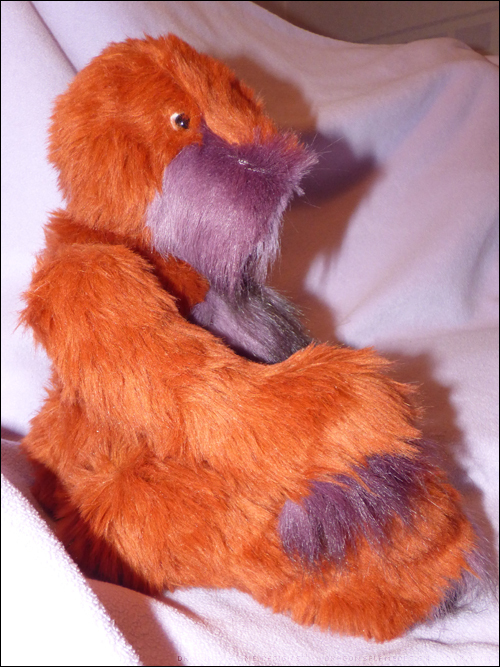 The only disadvantage is that the buttons really need hand sewing in place, because of their shape – I couldn’t get them to sit level for machine sewing! I’m hoping this one won’t take too long to finish – they’re forecasting some more warm weather for September, so it’ll give me a great opportunity to wear it if I’ve finished it by then! 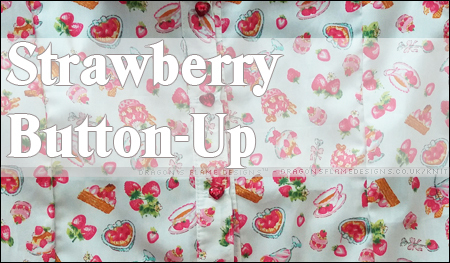 This entry was posted in Clothing, Sewing and tagged button-up, buttons, clothing, sewing, Strawberries, UFO, Winterwear Designs on August 28, 2018 by Sewist. 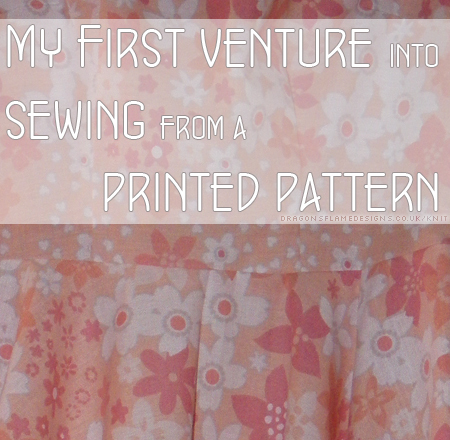 I’ve been wanting to make myself a shirt for a while, but the thought of all those buttons was putting me off! Instead of tackling the buttons for my first attempt at the Button-Up Top* by Winterwear Designs*, I decided to cheat and use poppers instead! So far it’s looking suitably shirt-like – hopefully the collar won’t be too challenging to sew! 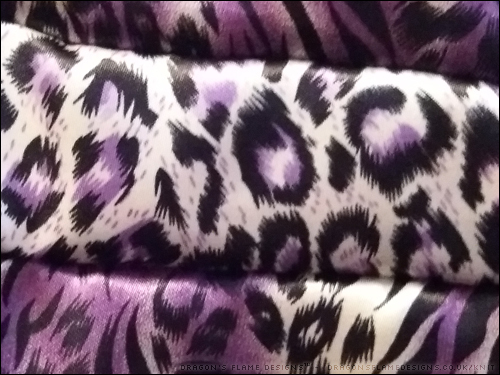 This entry was posted in Clothing, Sewing and tagged button-up, clothing, owls, sewing, UFO, Winterwear Designs on July 17, 2018 by Sewist. After trying some raglan sleeve t-shirts, I decided it was time I attempted a v-neck, and the Union Street Tee* by Hey June Handmade caught my eye. As usual with Hey June Handmade* patterns, the instructions are really detailed, so I figured I would be able to make a super v-neck…. unfortunately, due to user error, my v-neck is currently looking rather lopsided. As I was sewing the neckline band, I think I must have stretched one side further than the other…. unfortunately, I didn’t realise until I’d top stitched the band, so I don’t know if it’ll be possible to unpick to resew that. Maybe I’ll just leave it wonky, and call it a design feature! 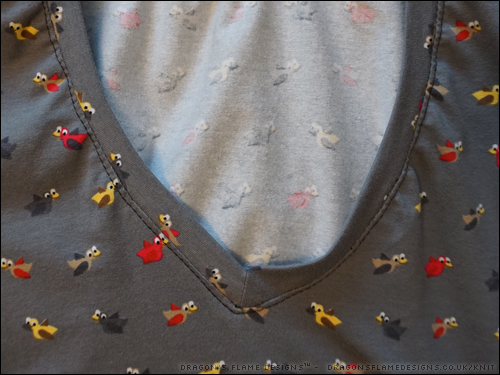 This entry was posted in Clothing, Sewing and tagged birds, clothing, Hey June Handmade, jersey, sewing, UFO, Union Street Tee, v-neck on May 22, 2018 by Sewist. 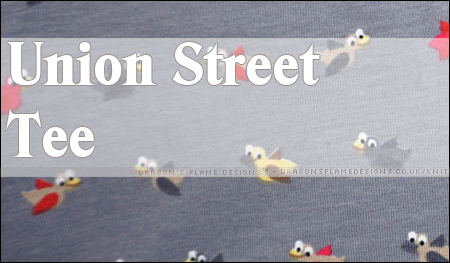 You’d think that with a blog called Dragon’s Flame Designs, I would have sewn several dragons already. 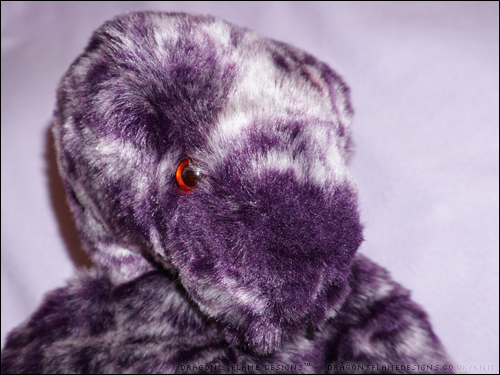 But while I’ve sewn lots of bears, I’ve never tackled a dragon…. until now! I’m reliably informed that K likes dragons, so Yoki Dragon looked like the perfect early Christmas present for him. I thought the original size might be a little fiddly to sew, so I scaled the pattern to 150% before printing. I’m using some red clothing fleece rather than minky, as I think it’ll stand up to rougher play. So far I have the head sewn, and you can just about see the dragon shape starting to emerge. 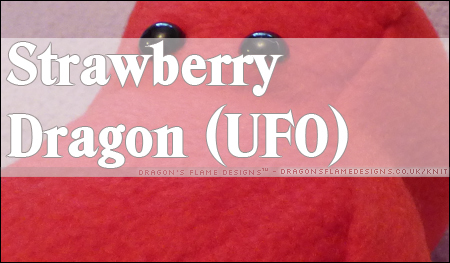 This entry was posted in Plush, Sewing and tagged dragon, plush, sewing, toy, UFO on October 3, 2017 by Sewist. I’ve been working on my dress for the Simplicity Sewing Challenge, using a couple of really sleek satin fabrics from Minerva Crafts. I measured out the bodice, stitched all the seams, then realised the waistline was about an inch lower than it’s meant to be (argh!). So I have to unpick the zip (which didn’t go in quite right in the first place anyway), to let me redo the horizontal bands and hopefully get everything lining up properly. So, I’ve come to realise that there’s no way I will get it finished before the closing date. If I hadn’t needed to unpick the zip, I might have managed it, but unpicking stitches on a satin fabric has to be done more carefully than on a polycotton, so it’s going to take a while. I’m determined to get it finished though – even if it will be too late to enter into the competition. 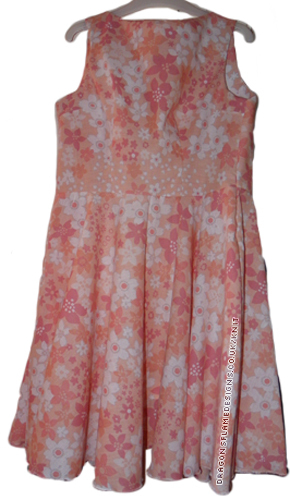 This entry was posted in Clothing, Sewing and tagged Dress, sewing, Simplicity, Simplicity Sewing Challenge, UFO on September 5, 2017 by Sewist. 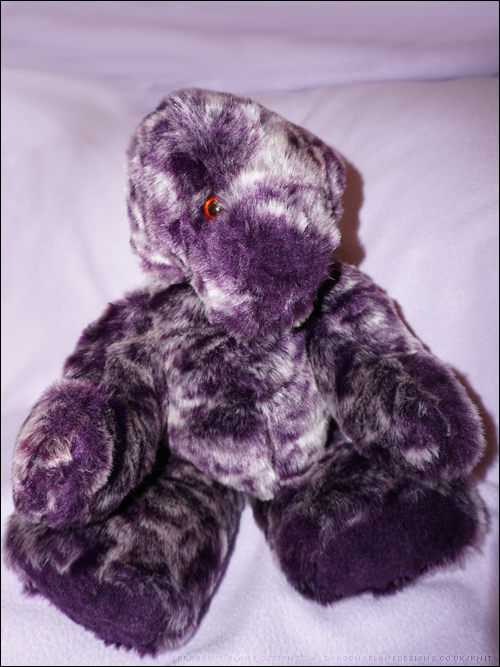 I was struggling to find any free “real” teddy bear patterns – there are lots of free patterns out there, but none that look like a true collector’s style teddy bear, so I decided to buy a pattern from Emma’s Bears. 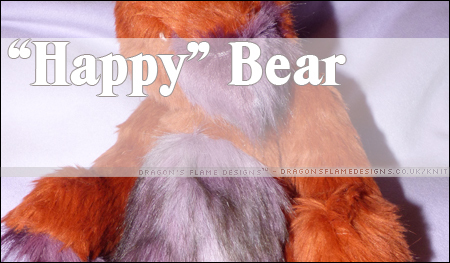 I picked Happy Bear, as I liked the idea of being able to make a two-tone bear. 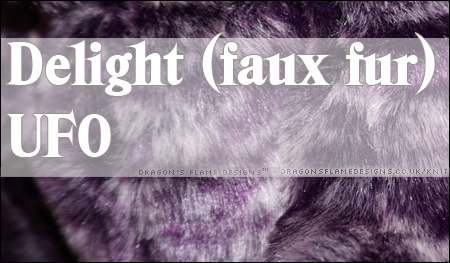 I already had the rusty red and purple fake fur left over from previous projects, and knowing how the fake fur tends to slide around while machine sewing, I decided to be reckless and hand sew all the seams! My hand sewing skills are somewhat limited – they tend to be a source of humour in the family, as I seem to have inherited my Great Gran’s skills…. the stitches don’t tend to be overly neat, and I always use a contrasting colour so they’re more visible against the fabric. I used two strands of sewing thread to hopefully give enough strength, and backstitched every seam. I will admit I used a contrasting coloured thread, simply so I could see the stitches if I needed to unpick any! But with the stitches being on the inside, nobody would be any the wiser for which colour thread I actually used. 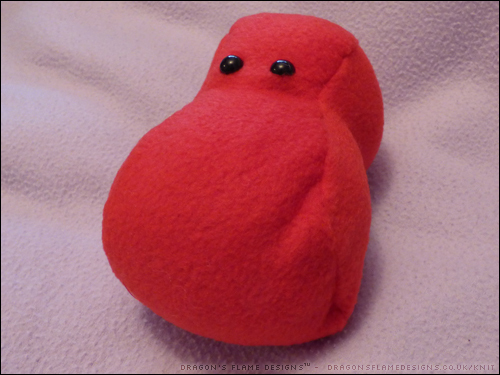 “Happy” is jointed to allow him to pose better, but I think he will look even cuter once he has ears, nose and a mouth. This entry was posted in Plush, Sewing and tagged bear, Emmas Bears, Happy, plushie, UFO, work in progress on July 11, 2017 by Sewist. 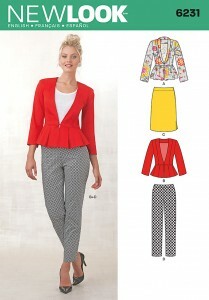 In the current issue (Feb – March) of Make it Today, they had a free gift of three paper pattern packs, which included New Look pattern 6231 – two jacket options, a skirt and a pair of trousers. 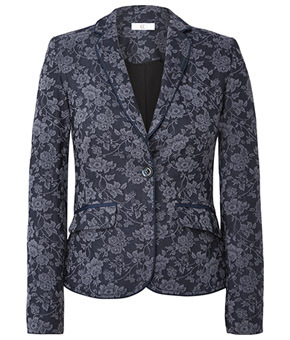 Although the trousers look the easiest to make, my legs aren’t really designed for tapered close-fitting trousers, so it had to be the jacket. So far I’ve got the front and back done, but a slight problem with the iron means that I’ve had to delay working on the collar until I can get the interfacing to stick to the fabric. 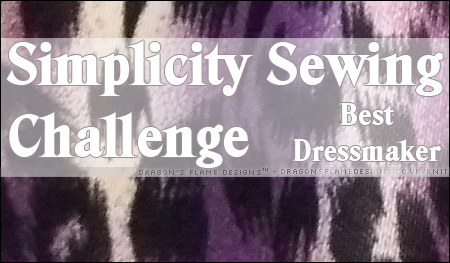 And speaking of Simplicity New Look patterns, have you seen their blogger challenge? This entry was posted in Clothing, Sewing and tagged jacket, sewing, Simplicity, Simplicity New Look, UFO, WIP on March 19, 2015 by Sewist. Now there’s a slight problem with the fit at the moment – I’m not sure if it’s just my measuring, my wonky seam allowance, or a quirk in the pattern, but using what I deemed to be the correct sizing, it’s an inch out at the back (oops!). So, I’m working on using the other part of the duvet cover to make a second third bodice that I can then attach to the existing skirt, and hopefully that’ll fit! The second one I tried was closer – the back pieces meet, but not enough to allow any seam allowance for the zip. I’ll get there in the end though! 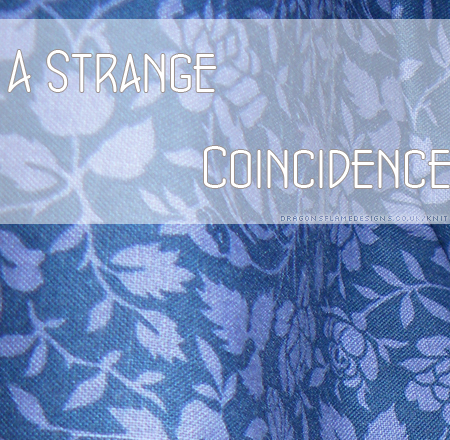 At the moment this project is shelved, as I want to try working on a pattern for a slightly less fitting top, and a shirt – I’m hoping that those patterns will help me learn how to shape the bodice of the dress, so I can get the darts in the right place, and finally have a zip I can do up! This entry was posted in Clothing, Sewing and tagged clothing, Dress, duvet cover, sewing, UFO, WIP on March 13, 2015 by Sewist.